Woolensails: Friday Finish, and Giveaway! Sorry to hear you aren't feeling well, hole the bruise and aches hel quickly along with your flu issues. I also send speedy healing wishes. Take care and I wish you (and Bill) a speedy recovery. That is a lot of snow, Debbie, and Bean will be in his glory playing in it! 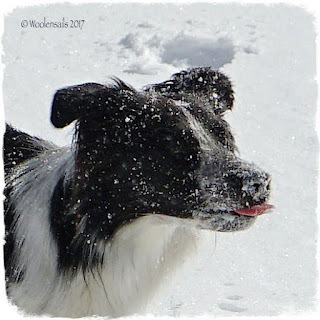 Ben loves eating snow and takes huge mouthfuls. You're welcome to have it as an adult I'm not fond of it at all. Oh, and hope I am lucky enough to escape the illnesses of winter this year. Hope you get feeling better. the caption is: No two snowflakes taste alike. I sure hope you are on the mend it sounds horrid. Ugh, I'm so sorry you've been so sick. I hope you didn't seriously hurt anything. Rest up for a few days and recover. Love the photo of Bean. "Looks like snow, tastes like sugar"
Oh my goodness hon, you just rest and take it easy - that's not good!!! I hope you're feeling better by now, and if not that you do quickly. Love your towel - I do think it would look wonderful with a couple of trees on each side. 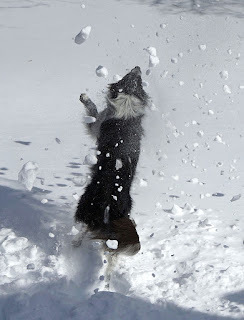 Bean sure is having fun - our Springer Spaniel used to dive into the snow nose first, she loved it too! Bean is saying, "Help! I can't control my licker". Sorry that you and Bill have the crud. Hopefully it doesn't lay you up much longer and you are able to heal your bruises quickly. 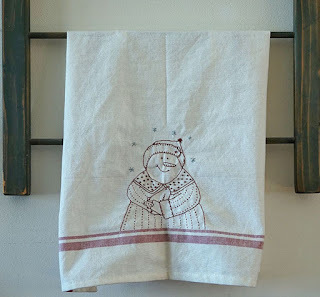 Your towel looks sweet and I like!E the idea of adding a tree or two. You do such beautiful work! So sorry you are ill! Hope things improve! Almost my whole family has sickness one way or another. Mine is sinus / cold rotten. Others much worse! How big is the Christmas box? Seems like you have already made several nice gifts to put into it. You are making good progress toward the holiday goal. Sorry you have been feeling bad. I am sick now too but not flu. Started with a sore throat and now coughing. I did not sleep much last night. Oh Deb....sounds like you had a perfectly miserable week....I hope this week will be better. Having the flu is no fun...especially when the hubs has it too...and you're right....we all know who takes care of who!!! 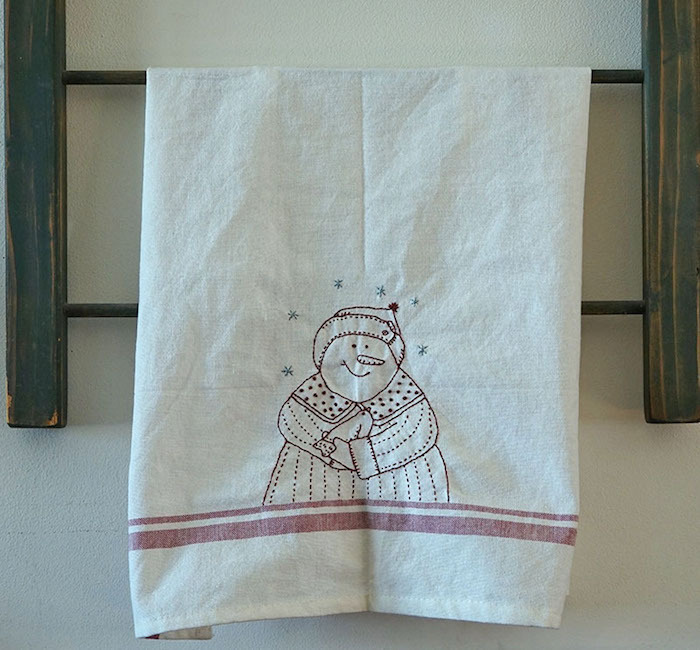 Love your little stitchery....the snow man is adorable! Hugs and hugs...feel better!